Olive Oil, Distilled Water, Organic and Sustainable Palm Oil, Coconut Oil, Lye, Shea Butter, Castor Seed Oil, Fragrance Oils, Squalene, Cucumber Puree and Oxides. Here’s to memories of walking on the sand ripples through the sea foam, picking up shells and breathing in that pure, fresh sea breeze! Lots of extras in this one--squalene oil is great on the face...and the cucumber is really nice on sun-drenched skin! It's colorful--with blue, green and yellow marbeled throughout! I have lots of customers who spend time in the water. So whether it's ocean water or the pool, your skin needs a little extra pampering. 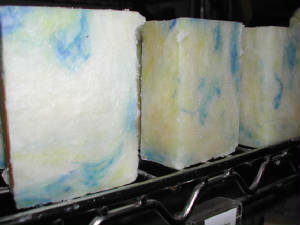 This soap offers it by the addition of three key ingredients--shea butter, cucumber puree and Squalene oil. Together they will treat your skin to a moisturizing smorgasbord after the day in the sun! The scent is one enjoyed by almost everyone--fresh and clean.